People who frequent the bookstores would know that besides my book, “Secrets of Singapore Trading Gurus”, there is a similar book, “Secrets of Highly Profitable Traders” by Chin Yong Sak. Before these two books, there were no books on the interviews with Singapore traders. Probably that was the gap that Yong Sak saw. You can read about the genesis of “Secrets of Singapore Trading Gurus”. While I was on this project, Eileen learned from the boss of Rank Books that an author was also interviewing traders in Singapore and would publish a book too. We went ahead and happened to publish around the same time. I had bought a copy of Yong Sak’s book and I enjoyed reading it. There were actually more differences than I thought and I would like to present to you. Of course, there are also pros and cons to each book. 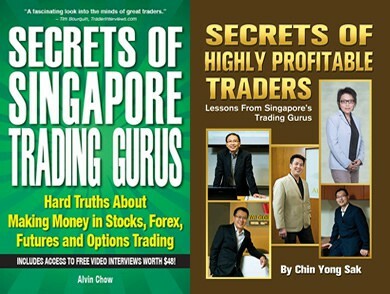 “Secrets of Singapore Trading Gurus” featured 8 traders while “Secrets of Highly Profitable Traders” had 5 traders. We do have 3 common traders – Binni Ong, Keane Lee and Nicholas Tan. Other than that, my book covered 5 other traders – Yeo Keong Hee, Clarence Chee, Tom Yuen, Patrick Lee and Dave Foo. Yong Sak interviewed Colin Seow and Jason Yee which I did not. What I like about Yong Sak’s book is that it has pictures of the trading charts to illustrate the traders’ strategies. He went deeper to discuss about one strategy from each trader, which gives the reader a clearer idea on their methods. Unlike my book which is more of a Q & A format, he compartmentalized and categorized the content. It read as though the trader has written the passages to the reader directly. I prefer to present the content in verbatim as much as possible to keep the messages of the traders intact. I want to minimize the loss of integrity and originality through editing. In addition of the text, you are able to view the video recordings of the interviews. By watching and listening to the traders, you can sense the body language and energy where words would not be able to describe. As you can see, I want to provide ‘real image’ as much as possible. If you are torn between the choice, I would like to say both books present rather different perspectives and you can confidently buy both books and pick up different lessons from them. PS: I do not see Yong Sak as a competitor. I see him as someone with a common interest and I am happy that we can both provide the public with a greater knowledge about the trading scene and education in Singapore. wow, alright i will go and get one! I’ve finished reading this book in approximately 15 mins. If you are interested in a book of similar style, purchase market wizards instead, the interviews are more in-depth and covers more bases. In this book, its the same few ‘secrets’. Somehow, i am unsure of some of the trader’s performance. I am a professional trader myself. I cant help but feel some of their performance are inflated. One trader claims a 90% winning rate with a reward:risk of 3:1. What he/she probably did not reveal is perhaps the frequency of trades available to get that kind of results, which could be once a month. An average read for beginners or someone looking for leisure reading. Not for serious traders, there are no ‘secrets’ found here.